Measles, one of the most infectious diseases known to man, is on the march again despite the efforts of health agencies that only a decade ago believed they were close to conquering the illness. 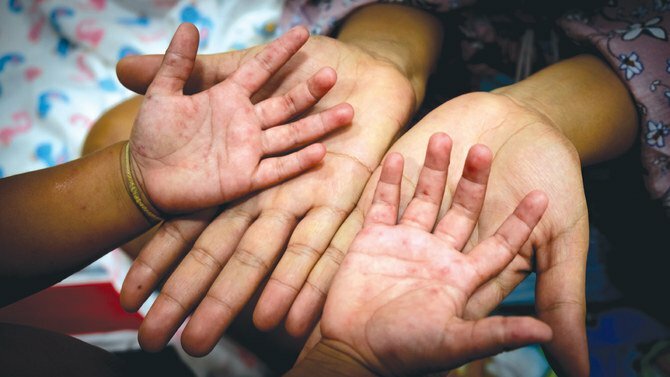 Outbreaks of the disease, which is easily preventable by a single dose of measles, mumps and rubella (MMR) vaccine, have risen sharply in the past two years, with children bearing the brunt of the illness, often with fatal results. The surge in measles cases has brought warnings from health experts, who say that gaps in vaccination are finally taking their toll. Urgent efforts are needed to increase vaccination coverage or the results could be devastating, they warn. Under a World Health Organization (WHO) global vaccine action plan, measles and rubella are targeted for elimination in five regions, including the Middle East, by 2020. The organization’s key public health strategies to reduce deaths from measles include routine measles vaccination for children, combined with mass immunization campaigns in countries with low routine coverage. Measles is transmitted by direct contact with infected droplets or by airborne spread. The disease killed millions throughout history before the introduction of the MMR vaccine in the 1960s. Despite the efforts of the WHO and other health agencies, there has been a global uptick due to gaps in vaccination coverage. A growing “anti-vax” movement around the world has also been blamed for the rise. The measles vaccine in Saudi Arabia is mandatory, and no child is allowed to enter the education system without proof of stamped vaccination cards. However, some parents have become caught up in concerns spread by the anti-vaccine movement, which grew out of a now-discredited 1998 study published in The Lancet medical journal. The study, which has since been retracted, claimed to establish a link between the MMR vaccine and autism. “There is a growing group of parents or caregivers who wilfully ignore or deny the benefits of vaccinations to children and selfishly reject all possible resulting threats to public health,” said Dr. Haya Zedan, an assistant professor of public health at the College of Health Sciences in the Saudi Electronic University in Riyadh. Arab News asked a number of “anti-vaxxers” in Saudi Arabia’s school community to comment, but they declined to go on the record. “This group may also be well educated and be of high socioeconomic status,” Zedan said. “I believe the key to resolving this may be a more proactive and visible stance being taken by the authorities, using solid evidence to refute claims being promoted by the anti-vax group.